You've heard of prisoners making license plates for cars, and even furniture, but how about model airplanes? According to this article from a 1962 edition of American Modeler, inmates at Southern Michigan Prison (SMP) used to build model airplanes that were then sold through a local "hobbycraft" store. No mention is made of the outlet's name, or whether the people who purchased the models knew that they had been built by SMP prisoners. The model airplanes building program ran for many years before the warden would allow flying within the prison walls because of the potential security and safety problems involved with propellers (stabbing implements), fuel (the facility had a few famous arsons during riots), steel control line cables (great for choking someone), glue and dope (sniffing), and razor knives (for clean cuts of throats as well as balsa). Only control line flying was permitted in order to contain the activity to a well-defined and monitored area. A quick search to look for prisons today that allow model airplane building and/or flying did not turn up anything. 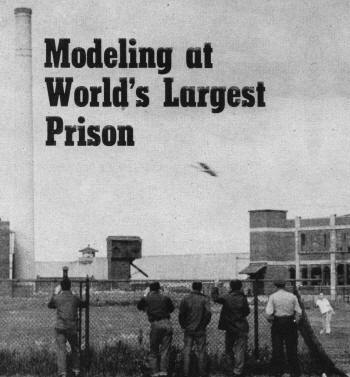 Modeling at World's Largest Prison. It can happen anywhere - including inside prison! "Well, back to the ole drawing board and workbench." 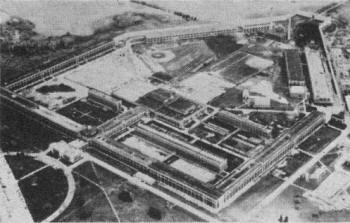 World's largest prison is at Jackson, Michigan. There's always an expert in the crowd like our friend here. The world's largest prison at Jackson, Michigan, might be the last place where you'd expect to hear the full throated roar of a perfectly functioning "35" model engine. But five evenings a week the stunters zip around the "back 40" - a portion of the Southern Michigan Prison recreation area set aside for the Southern Michigan Prison Flying Model Club. As a hobbycraft project, shelf-scale non-operating model airplane building has been permitted for quite some time. But only recently have the prisoners been allowed to fly planes. The club now has over a dozen members and interest is growing fast. "We used to build planes and sell them through the Hobbycraft store without even knowing if they would fly," said one member. "Now, when we sell one, we know we aren't disappointing anyone because we can test fly 'em." "I am concerned with the smooth operation of the prison," Deputy Warden Charles Cahill said, "and like in any prison, tensions will naturally build. Building models is a healthy and natural outlet for these tensions. I'm the Deputy Warden in charge of Custody, but the rehabilitation of men is a concern of mine also. When you have men involved and enjoying normal projects and taking pride in a job well done, you have men taking a step on the road to rehabilitation. "We checked with model builders in Jackson to set up the original ground rules for the model club here in the prison, and a lot of thought was given to the project. So far, we have had no violation of the rules, and are pleased with the results it is showing." Deputy Cahill went on to say that his 14 year old son was a model fan, and had a 6 foot job under construction. When the idea for the prison club was first advanced the drawbacks appeared to be noise, the highly inflammable fuel which could be a security risk, the models that could be a disruptive influence by flying over the walls. Through the cooperation of the custody division and the hobbycraft department, these problems were soon solved. The men would fly their planes only in the evening and at the distant end of the recreation area. 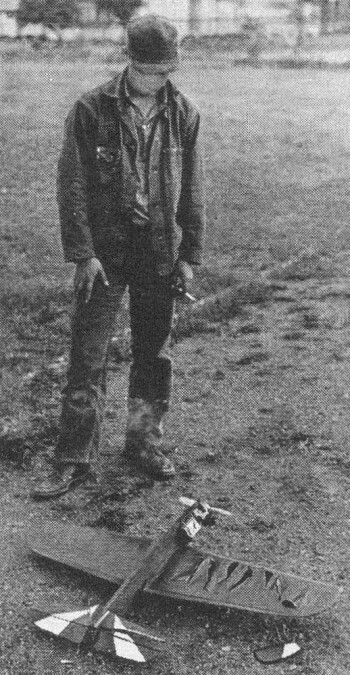 "Gas" would be checked out in small quantities (enough for one evening's flight activity) and none allowed in a prisoner's possession except in the flying area. And there are no free flight models. All planes must fly on control lines . 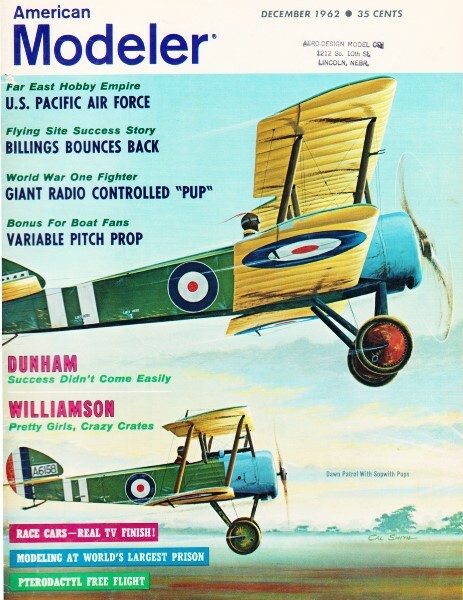 One evening when an onlooker asked why the flyers didn't use a longer control cable, a club member answered, "I put a lot of hours into building my plane and I don't want it shot down over 'enemy' territory!" 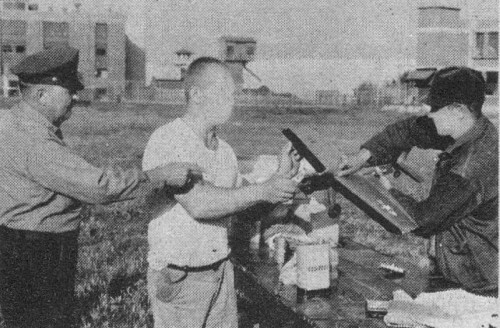 As with any new program in a prison, considerable caution marked the selection of participants for the model airplane club. They were carefully screened and only men with good conduct records and attitudes were cleared for membership. Hobbycraft Supervisor Hank Newcomb, through whose department all modeler's supplies are ordered, observed, "We probably have the largest and most inclusive hobbycraft department in any prison in the country - but in order to progress, we must constantly be on the lookout for new hobbies that will be permissible and not be a detriment to the men or institution. The model club falls in this category. It has worked out well, and men who have not previously taken any interest in hobbies have become quite enthused over the modeling. There are several benefits in building planes. Not only do the men get the pleasure of creating something, they have the fun of flying and learning how their creations work. This is about the only hobby we have where the man can actually keep and use the item he builds. Most of the other things go out on the counter for sale or home to relatives." Stan Riker, Assistant Supervisor of Hobbycraft: "I'm fast learning the difference in fuels and weights of balsa. These men are fastidious about what they order, and seem to know just what weight wood does the best job in what place. I think it is good they take pride in what they are doing and try to do the best job possible." The, model airplane club at SMP is more than a project to help the men pass time. Many prisoners never participated in group activities before entering prison. Now the modelers help each other with mechanical and structural problems. "These men take real pride in their planes," declared Hank Newcomb, SMP Hobbycraft supervisor. "When a man brings a new plane to the field the others crowd around and look it over. Perhaps for the first time, the builder receives attention for doing something constructive. This is important in his readjustment." The reasons for building and flying models are varied. One man said, "I wanted to build planes for many years. I had a photography studio and was too busy. Now, I'm serving a life sentence-­I've got plenty of time." Another confided, "I've got a boy who doesn't get too many toys while his dad is in prison. I can build models, test fly them and pass them on to him. The look on his face when I hand him a new plane in the visiting room - well ... !" Others make models for the pure satisfaction of creating something beautiful and functional. Many sell their models, not for profit but so they can buy more materials. Usually, going to prison means penal servitude. But in the case of model planes that go to the Southern Michigan Prison, their function is one of service. "As Director of Treatment," declares Gerald Hansen, "I approve of any project that will teach a man skills, patience and perseverance. Because this is a prison, and because there are many factors involved besides what the men themselves want, we are happy to find some new outlet for the instinct every man seems to have to build and create. Model building has filled a need here and we are happy to see men in the program that were not interested in any of the other hobby programs we have. "We are not 'coddling' prisoners when we permit them to build models and other hobbycraft items. We are attempting to teach them that they can do something they might take pride in - and this pride and skill just might be the deciding factor as to whether a man will return to prison or take his proper place in society and stay there."